Project obstacles and solutions: The $30 million International Orangutan Center is a matchless interactive exhibit at the Indianapolis Zoo. It includes an indoor atrium and outdoor areas where orangutans are free to roam. Visitors walk into the center's grounds with the apes above your head on a series of towers linked by cables. 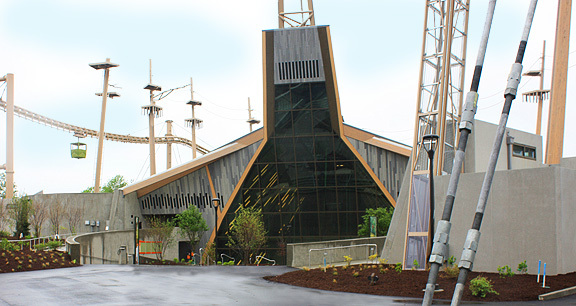 Visitors can take a skyline ride to get closer to any orangutans who are swinging in this unique overhead exhibit. The exhibit includes a meandering walkway and a staging areas for the skyline ride. Unique to the flatwork is a circular pervious concrete pad that filters storm water before it is drained into a landscaped rain garden. IMI supplied 38 yards of imix Eco Pave for this section of the project. Pervious concrete is used as both a water management and water quality material. Typically pervious concrete is placed without any kind of crack control. The voids in the aggregate are sufficient to handle freeze/thaw cycles and there is very little moisture in the mix to cause plastic shrinkage. However, this project called for the pervious concrete to be mixed with synthetic fibers to reduce any surface deterioration due to metal blades used to remove snow. J.C. Ripberger Construction handled the concrete paving portions of this project, including the pervious pad. They turned to IMI to design a mix with micro fibers to meet specs. IMI batched their imix Eco Pave pervious concrete together with synthetic micro fibers. Since water is flowing through the concrete, it was important to make sure the fibers were resistant to chemical and alkali substances that would run through the pervious slab. These chemicals are trapped in the concrete and are naturally broken down by bacteria in the concrete. While most people walking through the International Orangutan Center will have their eyes up looking for the primates above, most will be unaware that the pervious pavement under their feet will be taking care of any water draining off the site from rain. For more information on imix Eco Pave pervious concrete, click here.